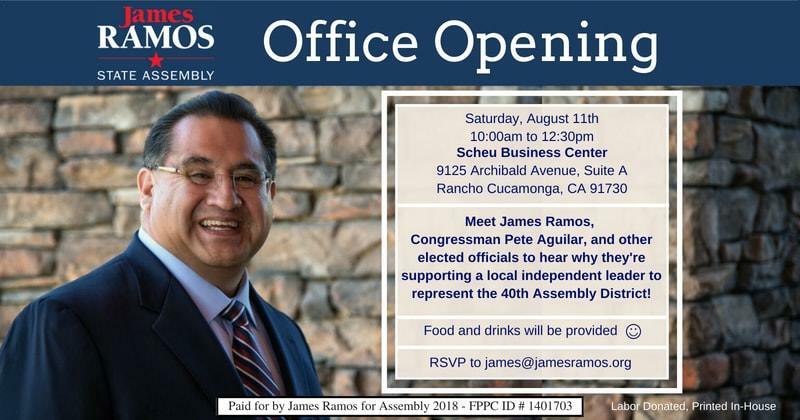 Please join James on Saturday, August 11, 2018th along with special guests, including Congressman Pete Aguilar, and other elected officials to hear about why they’re supporting a local independent leader to represent the 40th Assembly District! Details in flyer above, and on our Facebook event. Thursday, APRIL 25, 2019, 7:00 p.m. to 9:00 p.m. Regular Meetings are usually held at California Teachers Association (CTA) 430 E. Vanderbilt Way, San Bernardino, CA 92408 the 4th Thursday of the month except for November and December. Executive Board Meetings are usually held each month but the date, time and location are subject to change. Please check back regularly. © 2014-2017 San Bernardino County Democratic Party. Paid for by the San Bernardino County Democratic Party/San Bernardino County Democratic Central Committee [FEC#C00457200 - FPPC#742176] and not authorized by any candidate or candidate's committee, SanBernardinoDemorats.org. Contributions are not deductible as charitable contributions for Federal income tax purposes. Web site supported by the California Democratic Council, FPPC# 743865/FEC# C00229997. Not authorized by any candidate or candidate controlled committee.